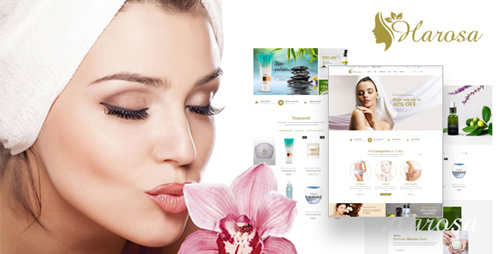 Harosa theme�is suitable for cosmetics and beauty online stores, as you guessed it, it is the most beautiful and professional�Magento theme. Needless to say, this theme has lots of smart features, neat layout & fully responsive. Megamenu display all of your product categories, sub-categories, top links to give your customers the opportunity to find whatever they need with the easiest way. The theme provides you a very attractive full screen slide show comes with large images & smooth text transition. Type of products (new, random, most viewed products) are displayed as tabs. Thanks to Daily deal module, you can setup countdown timer for daily deal, weekly deal or for any time period you want. Star rating and call to action buttons appear on hovering. Keep customers updated on the latest promotion and special offers by means of a Blog, when registering with Newsletter subscription they will get fresh news delivered to their inbox. Great section for your customers, neat testimonials slider and Instagram gallery integrated right into Harosa Magento theme � are you impressed yet? The user can find Social media follow links for quick sharing in the left bottom corner of the page. Moreover, it features multilingual and multi-currency support, which will bring more customers to your store.